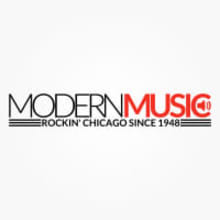 Modern Music is a retail musical instrument store located in the western suburbs of Chicago. We sell, buy, trade and offer consignments on new & used Guitars, Amplifiers, Loudspeakers, Mixers, Brass and Woodwind Instruments. We also offer Musical Instrument Lessons, Repairs and Rentals. We are an independent "mom and pop" shop full of professional players and engineers - not shareholders. Our staff dedicates a lot of our personal time outside the shop to playing and evaluating equipment in the real world. Sometimes one of us is performing right down the street, a couple of employees are often on tour and sometimes even on other continents! With all of our knowledgeable employees being performers and engineers you can assure that we know the stuff we're selling is up to our high standards. Our website is here to help you find the gear you need as well as let people know when we find a product that just knocks our socks off. Always feel free to contact us today with any questions about equipment, lesson schedules, rentals and/or repairs. At Modern Music we can assure you that your instrument will be fully checked over and packaged with the utmost care possibly. All of us here are musician’s and fully understand how important it is to receive gear in perfect condition.If there is any circumstances that prevent us from shipping your item via the standard ground shipping we will notify you prior to shipment. All in store items ship out on the same business day - after payment has cleared. In the event that we are out of stock in our store, we often offer drop-shipping from our top brands and those items can take another day or two to process. Free Shipping to Lower 48 United States: We will offer Free shipping on certain brands such as Warwick & Framus because we’re an Elite Dealer. These brands will be shipped via Fed Ex Ground. In Store Shipments: Guitars, Amplifiers, Cabinets, Pro Audio, and percussion will ship via UPS Ground. In store shipments on smaller accessory items will generally ship via USPS. All returned items must be received in brand new/unused condition. All items must be returned in their original packaging will all warranty cards, paperwork, accessories, stickers, and other materials originally shipped to you. If any item is returned in undesirable condition or missing any of the original shipped materials, a restocking fee will be charged or the package will be refused. Please do not attach shipping labels directly to manufactures boxes and use a trackable method of shipping. We process all returns with a few business days after the returned package is received and inspected. Special order products that ship directly from the manufacturer or distributor are sometimes non-returnable. This includes products from brands such as Warwick, Eden, Framus, Marshall, Washburn, Jay Turser, Randall, Quik Lok, Ashdown, Mackie, JBL. It is best to contact us directly to discuss if there is a return option for a special order product.